Why choose LAB Fermented Extract? Exposure of good bacteria to babies during their earliest years is critical to the development of a healthy digestive tract and immune system. When the intestines are high in good bacteria, potentially harmful bacteria have a lower chance of causing illness. Babies are basically born with no microflora present in their intestinal tract. They get their first “batch” of gut flora from mother’s birth canal during childbirth. This first exposure to bacteria allows her originally sterile gut to host a colony microflora. Hence, it is important for pregnant mothers to maintain a normal gut flora, so that they are able to pass down the good bacteria to their infant. Following birth, infant’s gut flora is influenced by his or her diet (breast milk or formula), environment and medicine such as antibiotics. Indeed, the gut flora of a formula fed baby is very different from that of a breastfed baby. Breastfed babies tend to get more good bacteria from their mother to keep them healthier overall, while formula-fed babies are more likely to be colonized with pathogenic bacteria. Even just one bottle of formula for a breastfed baby can disrupt the balance in the gut, and it can take several weeks to restore the integrity though breastfeeding. 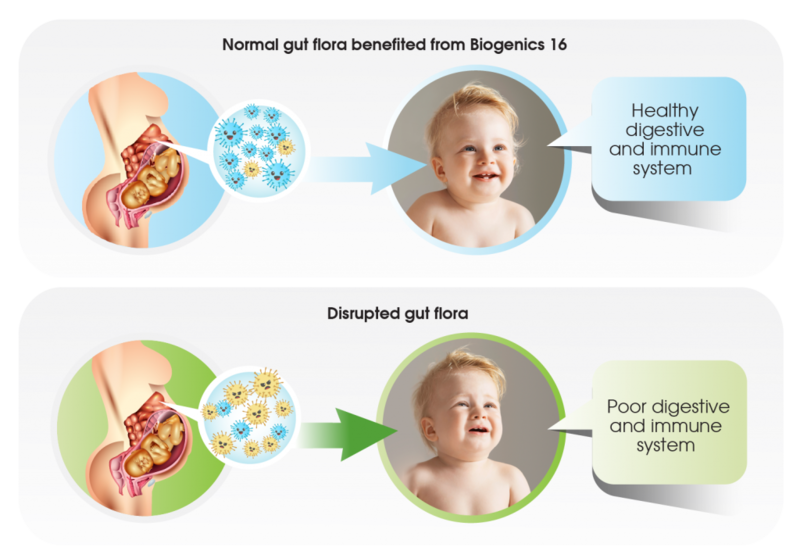 In fact, formula-fed babies, babies on antibiotic, babies delivered by Caesarean section and babies with digestive problems such as colic, diarrhoea, constipation and lactose intolerance are thought to have imbalance gut’s flora.